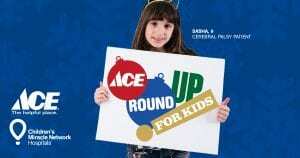 While you’re out checking things off your holiday list, be sure to stop in to your local Ace Hardware to “round up” for kids. Starting on November 23, you can donate to Johns Hopkins All Children’s Hospital, your local Children’s Miracle Network hospital, at participating Ace Hardware locations when you round up your purchase. Thanks to Ace Hardware continuously making miracles happen for our young patients and their families. We are so grateful for their continued support and passion for helping local kids.